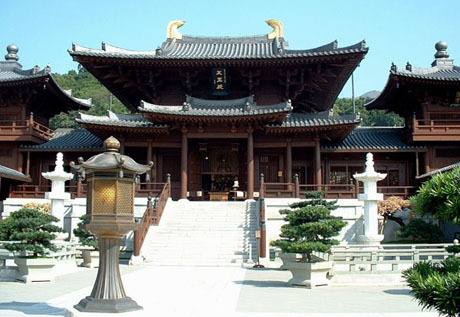 Chi Lin Nunnery was first opened in 1934 but substantially rebuilt in a major project involving designers, architects and traditional craftsmen from China, Hong Kong and Japan, before being opened to the public in May 2000. Located at the foot of Diamond Hill in north Kowloon amidst high-rise apartment blocks and with a mountain backdrop the nunnery occupies a 30,000 square-metre site which provides a tranquil retreat from its urban surroundings. It is sheltered on the left by the Mountain of Compassionate Clouds and guarded on the right by Lion Rock. The nunnery is home to about 60 nuns. Since 2006 the nunnery has managed the adjacent Nan Lian Garden which it helped to design and fund. 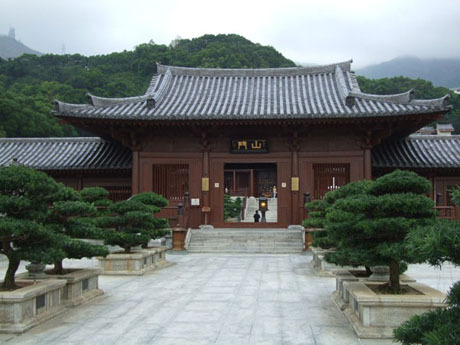 The nunnery is a large Buddhist monastic complex of fifteen magnificently crafted cedar halls, gardens, courtyards, gilded statues and lotus ponds and is modelled on the architectural style of the Tang Dynasty (618–907AD). 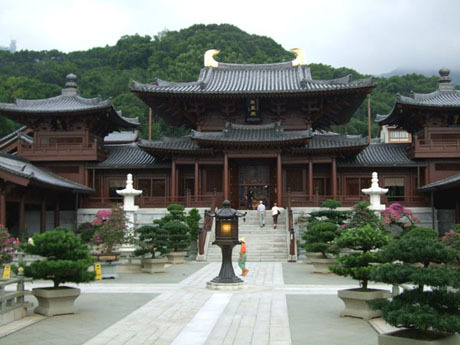 A Buddhist monastery is metaphorically described as a forest - cong lin in Chinese - which comes from the Sanskrit word Sangha, meaning a large gathering of monks and nuns from ten directions. Together they resemble trees growing like a forest. 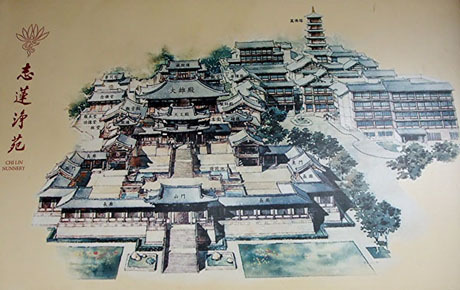 The design follows the ancient rules of Chinese architecture and fung shui principles. In constructing the buildings no nails were used, instead traditional techniques of bracketing and dowels were employed to hold the timber structures together and only natural materials such as clay, stone and wood were used. The main halls, which are built on a north-south axis, face the sea and back on to the mountains with ancillary halls to the east and west. The complex is arranged around three courtyards of which only two are open to the public. Visitors enter through the Shanmen (the “first door” or “mountain gate”) to the first courtyard. The first courtyard contains the landscaped Lotus Gardens with four large lotus ponds, statues, rockeries, bonsai trees in pots, cypress and peony trees. Corridors with colonnades and mullion windows run along either side of the courtyard and at the opposite end of the courtyard to the Shanmen is the Hall of Celestial Kings. 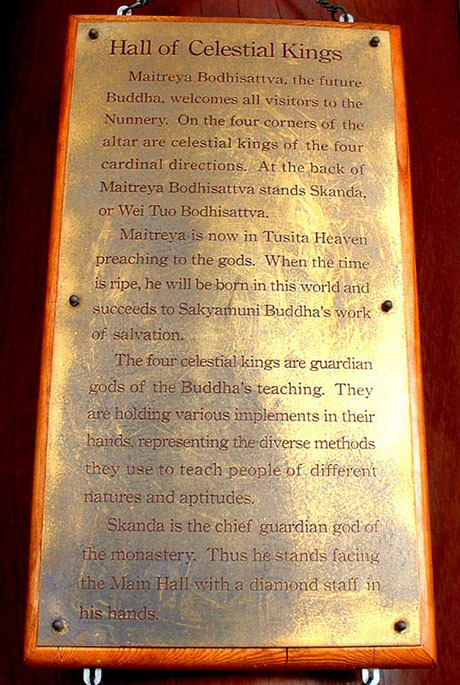 Inside the main door of the Hall of Celestial Kings is the statue of the Maitreya Buddha seated on its altar and surrounded by images of the Celestial Kings. The north door of the hall leads to the second courtyard. The second (inner) courtyard is surrounded by five halls and has covered passageways on either side. On the right hand side of the courtyard are the the Ksitigarbha Hall and Hall of Bhaisajyaguru. The Ksitigarbha Hall houses the statue of the Bodhisattva Ksitigarbha and, on the upper floor, the Bell Tower. The Hall of the Bhaisajyaguru, contains the statue of the “medicine Buddha” holding a medicine bowl and flanked by the Suryaprabha and Candraprabha (sunlight and moonlight) bodhisattvas. On the left of the courtyard are the Jai Lan Hall and Hall of Avalokitesvara. The Jai Lan Hall (also known as the Drum Tower) contains the statue of the the Bodhisattva Jai Lin, the “courageous, vigilant and diligent guardian” of the Buddha’s teachings. 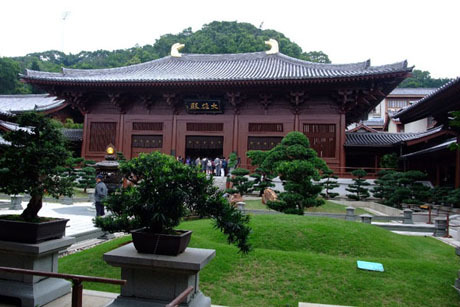 The Hall of Avalokitesvara houses the statue of Kwun Yam, the goddess of mercy. The Main Hall on the opposite side of the courtyard to the Hall of Celestial Kings is a magnificent structure with roof of 28,000 clay tiles, weighing 176 tons, supported by twenty-eight cedar columns. 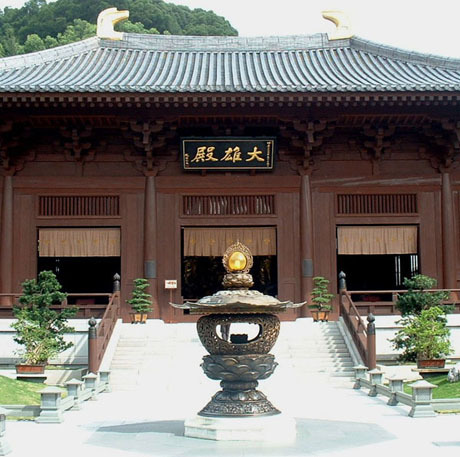 Traditional craftsmen from Arnhui Province in China were used in construction of the hall and roof which is supported by an elaborate ancient system of bracketing which allows the weight of the roof to be gradually distributed to the columns. 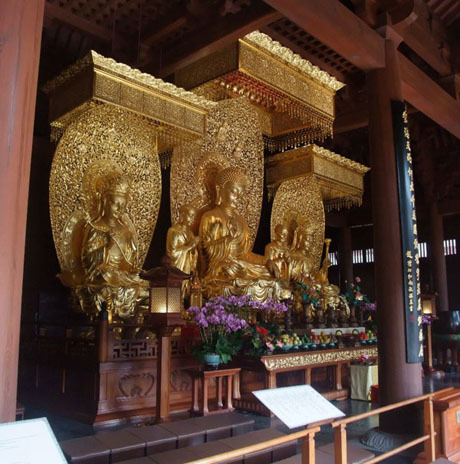 Inside the hall are five gilded Buddhas. In the centre is the seated Buddha Sakyamuni, the founder of Buddhism in India and known as “the Enlightened One”. Buddha Sakyamuni is flanked by two standing bodhisattvas, Mahakasgapa and Anada and two seated bodhisattvas, Marjusri and Samantabhadra. Beyond the Main Hall the third courtyard houses the Ancestral Prayer Hall, Dharma Hall, Patriarch Hall and the Ten Thousand Buddhas Pagoda containing over 10,000 Buddha images but unfortunately is not open to the public. 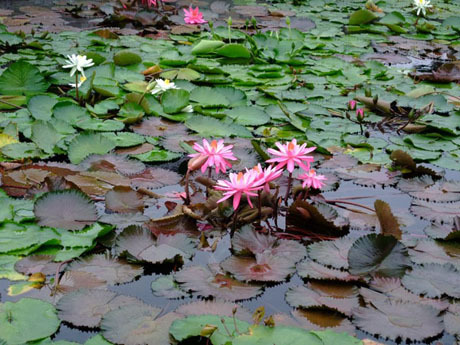 PHOTOGRAPHY – photography is allowed in the Lotus Pond Garden and courtyards. However, photography inside the halls or of the Buddha statues is not allowed. MTR Kwun Tong Line to Diamond Hill. The nunnery is about 8 minutes walk from exit C2 (Plaza Hollywood) at 5 Chi Lin Drive and can be accessed from Fung Tak Road. There are tourist direction signs to the nunnery from the station exit. Bus routes 11,74X,75X,82X,82P,84M,85C,85M,91,91M,92,286M to Diamond Hill Public Transport Interchange (under Diamond Hill MTR Station). Bus routes 3B,10,11C,74X,91,92 stop near the nunnery on Fung Tak Road. The Lotus Pond Gardens and nunnery can also be accessed directly, during opening hours, by pedestrian footbridge from the adjacent Nan Lian Garden.